No matter how many radical changes wash over heroes like Superman, Batman and Wonder Woman, DC Comics’ core pantheon of heroes maintain an iconic nature unmatched in mainstream comics. Even if you don’t follow the ongoing soap operas of their monthly adventures, chances are you have a passing familiarity with the broad strokes that make these characters who they are—which is one reason the publisher’s regular “80-Page Giant” anthology collections are so warmly received. Stories like “Glasses” in this week’s Mysteries of Love in Space should ring true if you have any affection at all for the Man of Steel—or for Lois Lane. Written by Groot and Judas scribe Jeff Loveness and illustrated by ‘90s Superman legend Tom Grummett, “Glasses” is one of seven brand-new stories (plus one vintage reprint) collected in the space-and-Valentine’s-themed anthology, which covers characters from Hawkgirl to Space Cabbie. With the issue hitting stands tomorrow, Paste is thrilled to offer an excusive preview of Grummett’s interior art, along with an interview with Loveness. Check that out below, and be sure to nab Mysteries of Love in Space on January 30th. Paste: You’ve written shorts in a few other recent DC anthologies. What does it mean to you to get to play with these characters in a less continuity-heavy sandbox? Jeff Loveness: I love it. DC characters are on a timeless pedestal. You can jump into Superman in any era and basically know what’s going on. There might be some ‘90s mullets or confusing electricity powers, but y’know… basically. And being free from continuity allows me to hone in and tell a universal story. It allows you to have a bit more of closure and personal statement. This is my third anthology special, and I think this is my favorite story of them all, so I’m happy DC keeps asking me back. Paste: Outside of DC, you’ve done mini-series and ongoing comics as well—what do you find more challenging to script, a succinct done-in-one or a longer story? Is it tricky to say what you need to say in a smaller page count? Loveness: They’re both fun in their own ways. I feel a lot of emotion and pride looking back on stories like Judas, World Reader, Groot and Nova because we were able to tell fun stories during chapters of my life. So I look back on those with fondness. But telling these one-off stories feels like a fun, accessible way for me to pop in and say, “What’s my Superman story?” If I only had one shot at the character, what would I say? So yeah… both great experiences, but I’ve been loving these short stories. 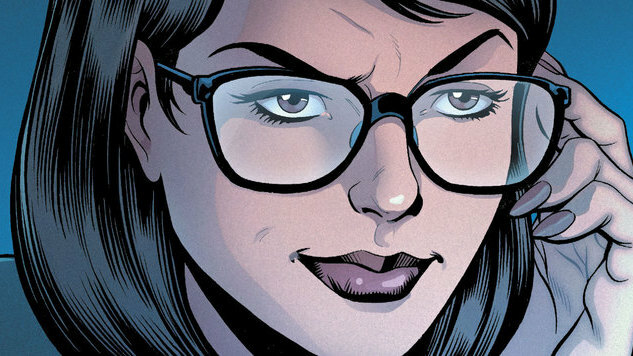 Paste: Your story in Mysteries of Love in Space starts off with Clark Kent’s glasses and a nod to the long-standing disbelief over Lois never recognizing that Clark and Superman were one and the same. What inspired you to talk about their relationship, and to call back to the era when Lois thought she was talking to two different men? Loveness: I’ve always felt bad for all the flack Lois gets about the disguise. I think the Clark Kent disguise is somewhat beautiful. If Hamlet can get confused and stab a dude through a sheet, I think some people can get confused about a low-key dude in glasses who slumps and has a passing resemblance to Superman. It says a lot about duality. Self-perception. The way we overlook people we think we have status over. I love the status quo of Lois knowing Clark is Superman, but I think there’s something interesting about the classic approach, and it was fun to dive into all eras of their relationship. Paste: Although Lois narrates your story, it’s also about Superman’s seemingly endless well of empathy. What sort of role do you think Superman plays in this day and age, where caring about things without irony isn’t always celebrated? Loveness: I think Superman’s more important than ever. He’s an adopted immigrant from a planet that denied science. He works in a dying industry in the name of truth itself. His enemies are fascists and billionaires. He’s in love with the smartest woman in the room. He’s kind and humble—which is something we desperately need. I think we’re at a tide shift in narrative culture—where kindness and earnestness are coming back around. I like people who care. I like people who want to make the world a better place. I’ve always been impressed with Superman’s longevity—his wax and wane in popularity. Even when we think he’s out of touch or out of date, he comes back around and surprises us. He’s a cool, lonely dude. I’m so lucky I got to write him. Paste: Tom Grummett was a hugely important name in ‘90s Superman comics. What was it like collaborating with him for this short? Loveness: Oh man. He IS Superman to me. I grew up reading his work. It was very emotional to see his art come in. The guy who drew my Superman DREW my Superman. It’s… I’m still processing it. I feel so lucky to work with a legend like that.